Exterior Grade Quilted Fiberglass Absorbers reduce the reflection of sound waves by covering reflective surfaces with a suitably UV protected, porous, sound absorbing product. 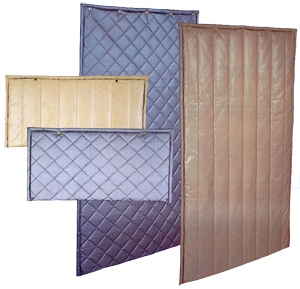 The exterior Quilted Fiberglass Absorber consists of a heavy-duty vinyl-coated-polyester facing on both sides of a 2″ thick quilted f iberglass. Wall panels are constructed with grommets across the top and bottom, and are sewn with an exterior grade thread. Fiberglass core, faced with heavy-duty vinyl-coated-polyester (VCP) on both sides. Exterior Grade faced quilted fiberglass absorbers are used to reduce reverberant noise on permanent outdoor applications such as enclosing HVAC equipment, dust collectors or similar machinery behind a manufacturing plant where UV resistance is required. It is commonly installed over wood fencing or on brick or masonry walls of buildings adjacent to a job site or a noisy piece of machinery.